Commit! and TG invite anyone helping Texas students plan and prepare for college to gain a deeper understanding of the financial aid process. 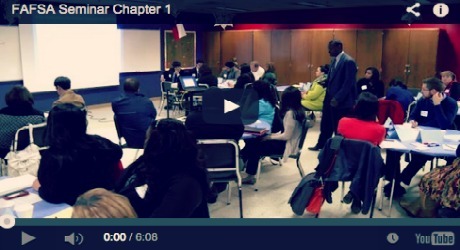 The following presentation given by Richard Sapp, Director of Pre-College Success at TG, was filmed during a January 15, 2014 training for the Texas College Access Network – North Texas (TxCAN-NT). Divided into nine chapters, the training covers financial aid basics, unique student scenarios, and how to help students complete their Free Application for Federal Student Aid (FAFSA) or Texas Application for State Financial Aid (TASFA). TG offers multiple training presentations throughout the year, which you can learn more about by visiting http://www.tgslc.org. If you have additional questions, please reach out to the Texas Financial Aid Information center at 1-888-311-8881 or TXFinAidInfo@tgslc.org. What happens after a student submits their FAFSA? Who fills out the TASFA?